In one of my scriptwriting classes in college we were asked to write an opening scene for a film that included zero dialogue. At first thought this may not seem like too large a task (just write a bombastic action sequence that hooks the audience, right? ), but to set that up, to provide context would be something more difficult. It would have to be all about the visual clues, the details included that would be vital in pushing the story forward. That is why what director J.C. Chandor (Margin Call) has done with All is Lost is both extremely difficult and at the same time extremely impressive. That the writer/director has accomplished this stylistic choice with such naturalism that the audience never feels as if it is forcing a "no dialogue" rule on itself is all the more reason to be surprised it succeeds as well as it does. With a running time of an hour and forty-six minutes the film can sometimes be a bit of an endurance test as to just how much more our unnamed protagonist can take and though it rises and falls from high-pressure situations to mild boredom in spots, we never want to leave our surrogate character until we at least know the conclusion of his journey. That is what this film is about after all, for it is not a movie we go to the theaters to buy popcorn and entertain ourselves with, but instead is nothing short of a captivating experience that places us right in the middle of the isolation with the silence forcing us to question how far we might go before we give up; before we decide that putting up a fight might not be worth it any longer. It isn't your typical cinematic experience, but it is one that demands to be seen on the big screen and that in its own right makes this an experience worth having even as it tests everything that you find comfortable about your life. Robert Redford in All is Lost. 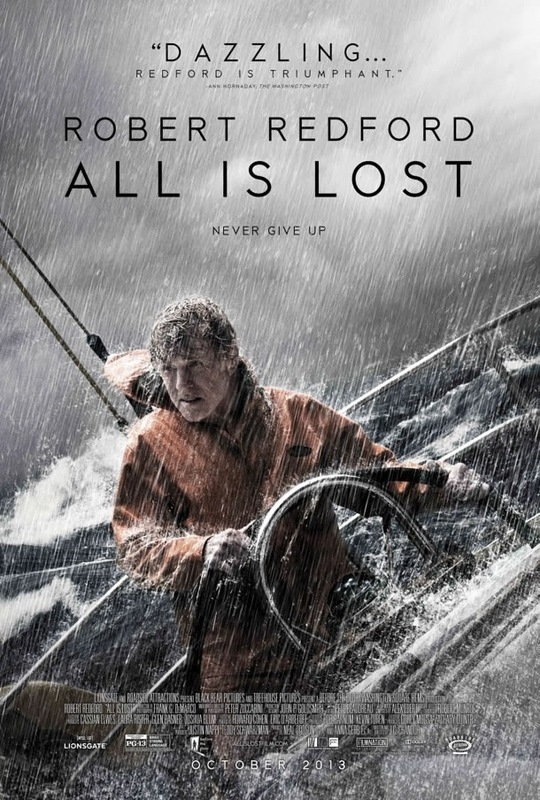 There isn't so much to be said in terms of story concerning All is Lost as the only character involved is Robert Redford's unnamed protagonist that is simply referred to as "Our Man" on the IMDB page for the film. 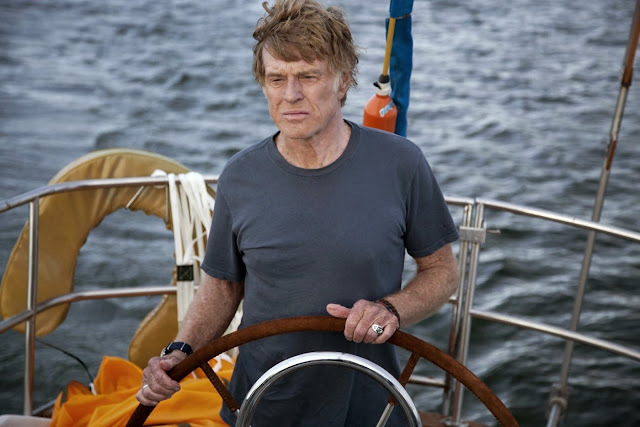 What can be expressed without giving too much away is that we meet Redford's character deep into a solo voyage into the Indian Ocean, 1700 miles from the nearest land, on his 39-foot yacht which he has named Virginia Jean. As I stated previously, there is very little in the way of dialogue. 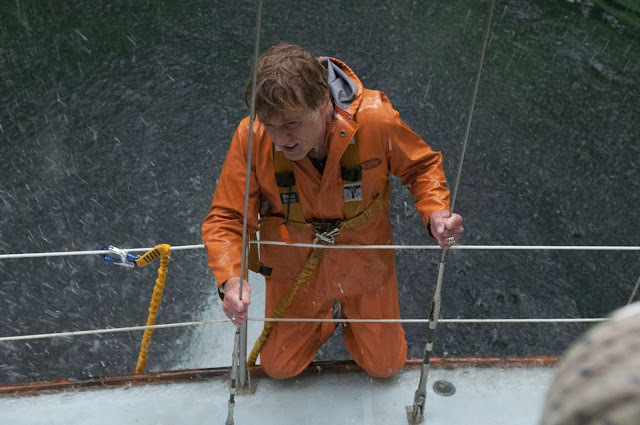 An opening scenic shot of the ocean delivers the most talking we will get throughout the remainder of the film in which Redford reads a letter he has written to an unknown recipient only for the film to then immediately jump back eight days to show us the beginnings of our heroes journey. The Virginia Jean is taking on water after it has collided with a rogue shipping container left floating in the sea. Thoughts of the human condition and if one is privileged or greedy enough to put themselves into such a situation such as this meaning they should be intelligent enough to get themselves out begin to run through my mind. At least this rings true in the case of Redford's character as he begins utilizing his navigation tools as well as patching the hull that was breached by the container. Still, his challenges are far from over once he repairs his boat as he is heading straight for a violent storm with his electronic equipment, including his radio, all but destroyed. He is forced to use his nautical knowledge to face the oncoming storm and find the best way to survive it using only the tools he has around him. To go into further detail would only lay out the remainder of the film for you and in fact spoil some of the surprise as to how they manage to tell a complete story and develop their singular character with almost no one talking throughout. The film does use several familiar archetypes as obstacles for Redford in that he comes up against not only the unrelenting storms, but circling sharks, dwindling supplies, and the consistent beating down of the sun yet it all feels genuine and in no way contrived because we slowly build an unspoken rapport with this man we know nothing about and it is in this investment in the character that we also become wrapped up and involved with the film itself. This kind of manipulation by the filmmaker can only be accomplished so effectively if we truly begin to feel we know the people we are watching on screen and it is almost completely due to the performance by Redford here that All is Lost succeeds as well as it does. I don't know much about sailing, personally, and so I was somewhat worried I would have no idea what Redford's character might try to do or attempt in order to save his life, but the concern of not being familiar with what needs to be done in order to preserve a yacht as long as possible were washed away when it became clear the larger objective for the film was for it to connect with audience members not on a technical level, but on a basic human level without ever uttering a single word or using an overbearing amount of music to manipulate how we are supposed to feel. There is a score here, but it is very subtle and only used in sparing moments where it seems to represent more of how our character feels, how his words would sound if he had anyone to talk with rather than simply sounding like what a movie soundtrack is supposed to sound like and placing it in high-tension moments to up the excitement of a scene. It is only present to convey what might not be interpreted from Redford's performance and to be honest, that isn't much. The thing about Redford's performance is that it doesn't immediately hit you like it is something to be appreciated or anything grand that is worth any extra attention, but it is how simplistic in nature it is and the small subtleties of what he brings to a man on his own and who is forced to come face to face with the fact he may not see his life past the next few days or even moments that hit us in big ways. There is no other character or storytelling tool that gives us any indication of these themes other than the sole performance we watch unfold on screen. It is a character arc that seemingly doesn't exist on the scale of where this man was at in life when we first meet him and how far he comes, but instead it is more on a scale of how he takes everything that has made him who he is up until this point in his life and puts a question mark on how much is enough when pushing to stay on this earth another day. Redford is put through the ringer in his one man show. While watching All is Lost I began to contemplate what I might say in this review and how I might go about assessing what I was taking in as it wasn't anything I necessarily found to be entertaining, but was instinctively inclined to believe I was seeing something of a certain pedigree that, if nothing else, was to be respected. I won't lie and say I was wrapped up in every second of this mans journey and that I was compelled to go out and appreciate every moment of every day because I did have moments where I was bored, where I wondered what they could possibly do next that might keep me interested in whether or not this guy was going to live or die. Somehow they managed to pull it out though and when I looked at my watch for the first time I was surprised to find an hour had already passed and that there were only forty-five minutes or so to go. So, is it entertaining? No, not necessarily, at least not all of the time, but where it draws its power from is stringing us along and better acquainting us with this man so that when he does finally come to the end of his journey it really hits home. I of course won't say which way it goes, but to say that it is powerful is an understatement. It is one of those cases where you sit, taking in the experience of the film as it goes by wondering if it is ever going to amount to anything more than what you've seen so far (and as I was seeing this rather late in its run, I'd heard nothing but overwhelmingly positive reviews for it) and would come out the other end really leaving you with a sense of wonder. It is in certain moments though that you realize this is developing slowly into something you don't see all the time. It is a slow burn, but not in the traditional sense as it has its own hills and valleys throughout yet it is the final scene in which we realize the power it has risen to and in that moment what it possessed over each individual in the theater. This is a film both full of experimentation and well-tested formulas as Redford delivers what we have come to expect from an actor of his status and range while translating more than many of his peers might be able to do with no dialogue and no one to play off. While that very premise not only strikes an interesting chord but one of fear in an audience that might be wondering what they're in for when promised two hours of a silent survival story, yet the result is worth a look and a proper one on the big screen at that.